* LOW RISE,EASY TO MOUNT,STEP THROUGH FRAME DESIGN. The M450’s strong, compact frame is designed with the female rider in mind and features a low rise top tube for easy mounting and dismounting. Also made it more challenging for some riders,including short women,the elderly or those who may experience issues with balance,to suit a wider range of riders. * FULL SUSPENSION. MOTAN M-450 features a dual-suspension,MOZO 100mm travel front fork suspension and built-in seat post suspension,offering a super comfort and smooth biking journey. * POWERFUL MOTOR.With its hub mounted 500 watt brushless motor and 48 volt lithium ion Samsung battery, the MOTAN M-450 has the power and range to accompany you on adventures of almost any length and duration on a single 4 hour charge. 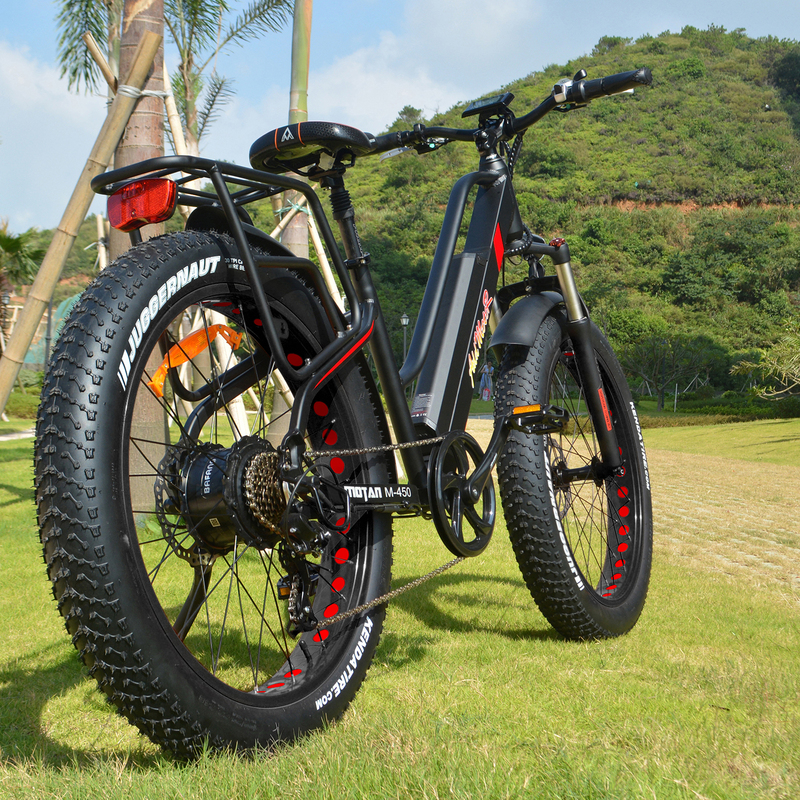 With 500 watts of power you can reach the max speed 25 miles per hour move using the electric motor to assist as you pedal. * USE ELECTRIC POWER OR PEDAL ASSIST OR MUSCLE POWER TO MOVE ALONG. The M-450 offers three modes of muscle power,electrical pedal assist or full electrical operation to allow you to cruise effortlessly or help you get to a higher top speed, or even climb mountain hills more easily. 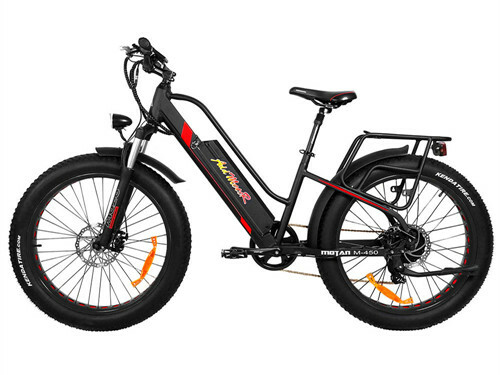 * STURDY IRON REAR RACK.The MOTAN M-450 electric bike comes with a sturdy and detachable rear rack,conveniently to manned or carry goods,all depending on your own need. * RANGE IS 50 MILES OR MORE ON A SINGLE CHARGE. 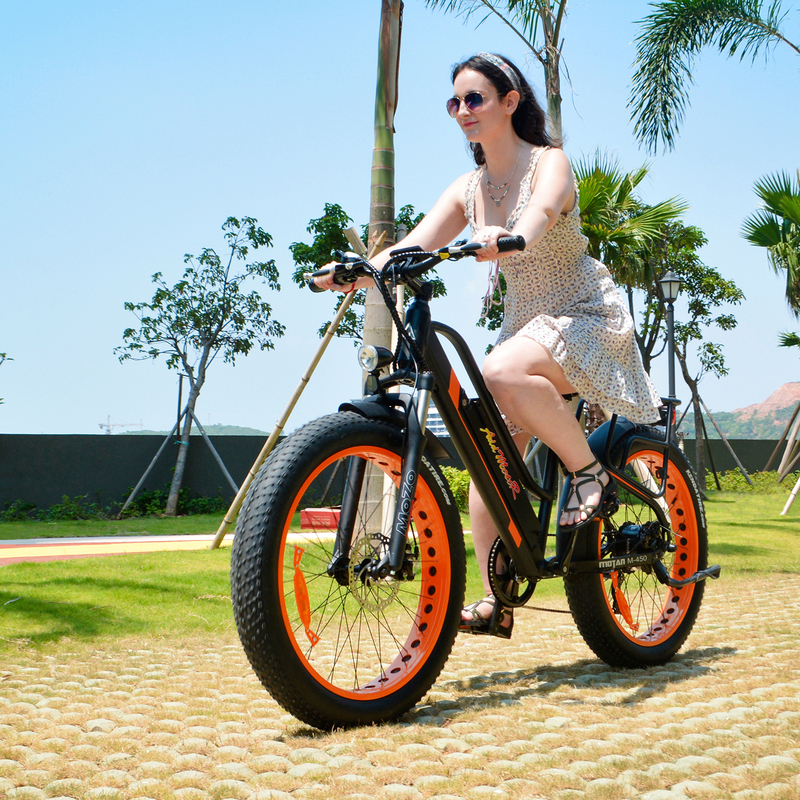 With the large capacity 10.4AH lithium battery, Addmotor’s M-450 have a super strong endurance,offers a maximum range of 50 miles on constant pedal assist mode,or even more using it intermittently. Motan M450 is designed on the basis of M550, which in response to the stand-over height of the frame.It allows many older people with some physical issues to continue riding in challenging geographic conditions and they re-discovered a bicycle's ability to promote freedom and fun.The upright riding position and huge four-inch tires make it the most comfortable bike you'll ever ride! It is also very nimble and easy to ride. 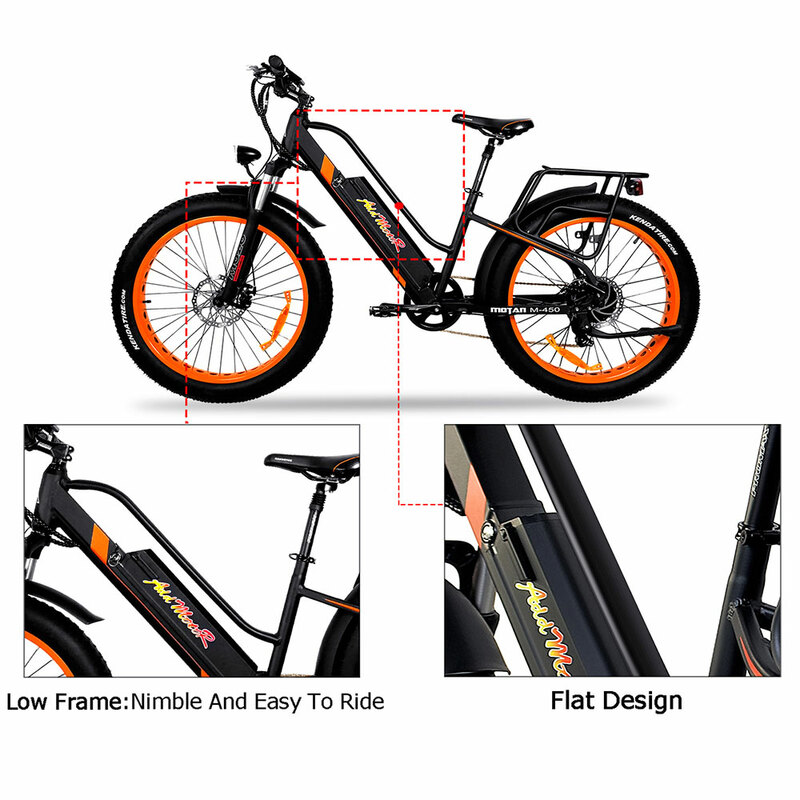 The bike starts with a sturdy steel frame and fork platform. Low-rise style handlebars provide sure handling. Front and rear hand activated linear pull brakes slow things down. And those big, big tires roll over practically anything. It feels like you're riding on a magic carpet. Plus it just looks so cool!The chief difference noticeable in the new Motan M-450 is the style of the 6061 aluminum-alloy frame. 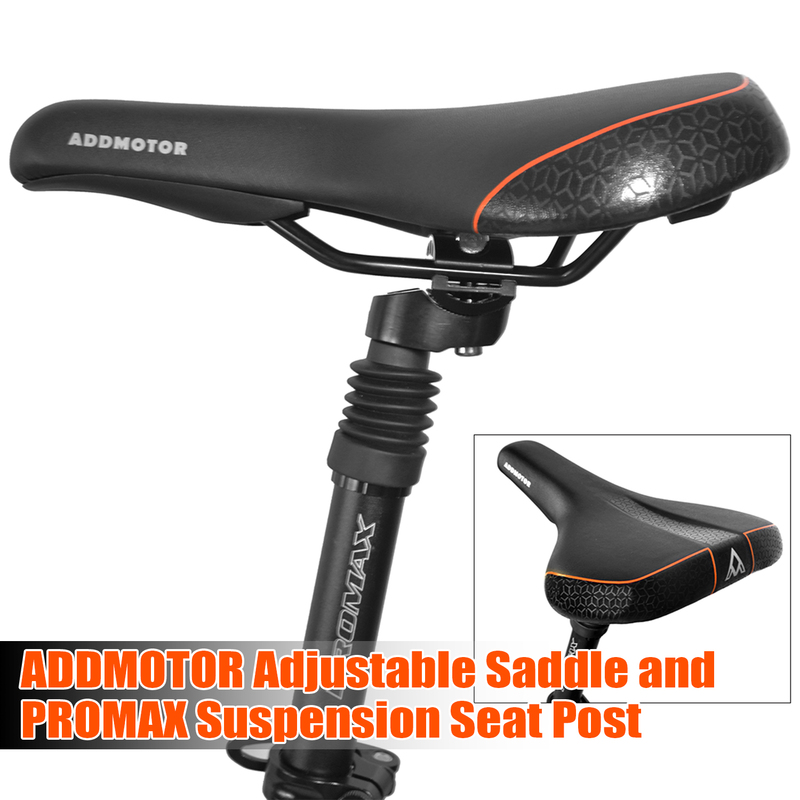 The double suspension (including front fork shock absorbers and built-in suspension to the seat post) and 4” wide Fat Tires offer a superior level of comfort, ensuring that riders will coast over any bumps they may encounter in the road. 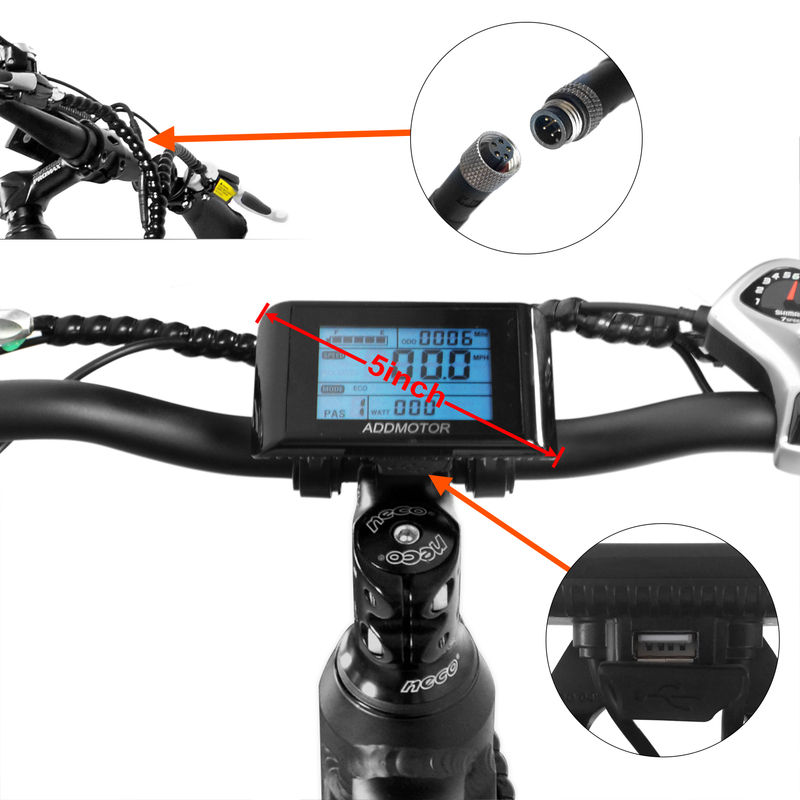 This bike was designed for the modern commuter.It comes with a 5 inch LCD display which show the parameter including speed,battery status,distance,biking mode,and also equipped with a USB outlet to charge your electronic devices, so you always have energy wherever you go.Addmotor adjustable saddle and promax suspension seat post allow you to adjust the position. 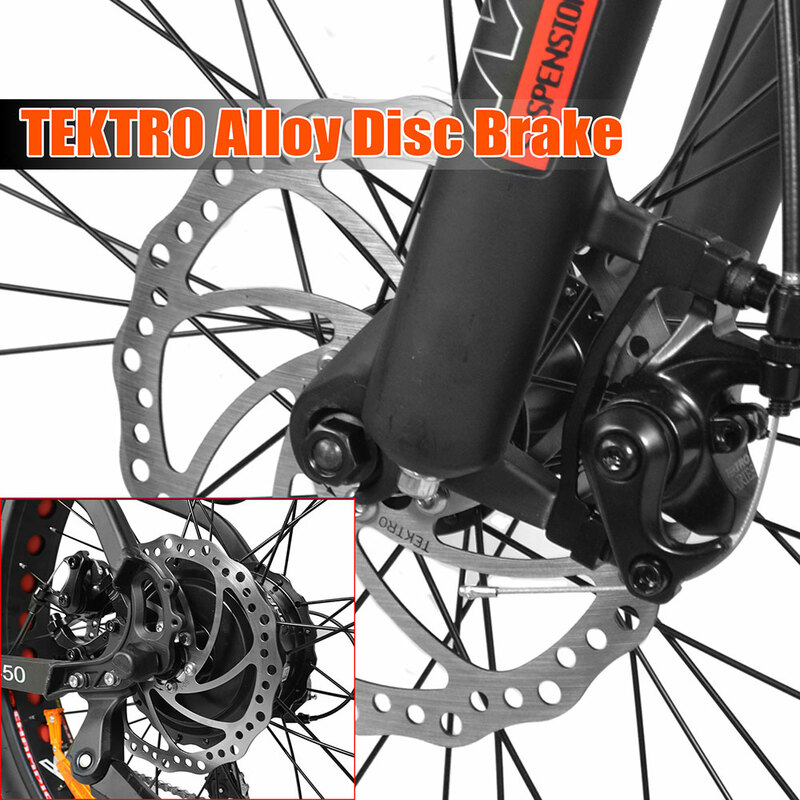 Tire: Kenda 30tpi Fat Tire 26" X 4.0"